Relieves coughs and spasms associated with colds, flu, bronchitis and other upper respiratory tract infections. Contains expectorant herbs traditionally used to help clear mucus from the lungs, dissolve and clear phlegm and relieve bronchial congestion. Also helps relieve dry, hacking coughs, ease spasmodic coughing spells, and soothe the bronchial airways. Specially formulated according to the principles of traditional Chinese medicine to help maintain Lung health and support respiratory function. Immune-supporting formula to help fight upper respiratory infections and aid recuperation. For best results, we recommend combining Cough Lung Tonic with Fusion® Cold & Flu to help reduce the severity and duration of cold and flu symptoms, or Astra 8 Immune Tonic to boost resistance to infection and promote recovery. According to Chinese philosophy, it is natural for the Lung Qi to disperse in a descending direction. However, when you’re affected by an upper respiratory infection such as a cold, flu or bronchitis, your Lung Qi may accumulate and eventually move upwards instead of downwards, triggering a cough. 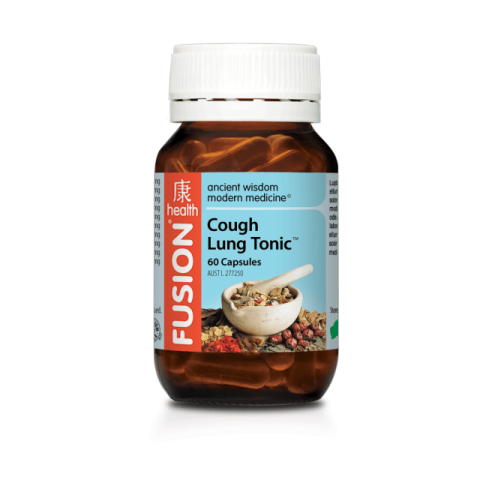 Fusion Health Cough Lung Tonic™ contains the Chinese herbs Pinellia, which has traditionally been used to promote the descent of Lung Qi and Balloon Flower, which aids its dispersion in the body. Take 2-3 capsules 1-3 times daily. Child 6-12 yrs: Take 1-2 capsules 1-3 times daily. Child 2-5 yrs: Take ½-1 capsule 1-3 times daily. Mix capsule contents with a little syrup or honey.